She also appeared in The Edge (1992), Ferris Bueller (1990), and had a recurring part on Herman's Head (1991). By 1993, she was floundering. Then, in 1994, a pilot called "Friends Like These" came along. Originally asked to audition for the role of "Monica", Aniston refused and auditioned for the role of "Rachel Green", the suburban princess turned coffee peddler. 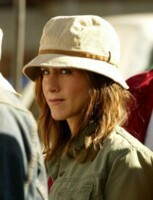 With the success of the series Friends (1994), Jennifer has become famous and sought-after as she turns her fame into movie roles during the series hiatus.